Canadian MSO Shaw Communications Inc. appears to be the first North American cable operator to deploy a Docsis 3.0-fueled Internet tier that allows downstream bursts of up to 100 Mbit/s. Shaw is promoting the new tier in its Saskatoon properties under the "High-Speed Nitro" brand. Shaw is pairing that bonded downstream with a single-channel Docsis upstream that limits speeds to 5 Mbit/s. 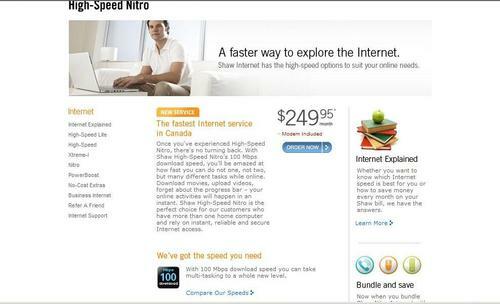 Customers who take the tier are subject to a monthly 200-gigabyte consumption cap. According to the promo, the new wideband tier runs C$249.95 (US$208.89) when bundled with another Shaw service. It costs C$269.95 (US$219.20) per month as a standalone service. Shaw's next level of service marketed in Saskatoon, "High-Speed Warp," offers 25 Mbit/s down by 1 Mbit/s for $88 per month, and is subject to a 150-GB cap. Although Shaw, which expects to deploy Docsis 3.0 in multiple markets this year, is pushing the needle with a 100-Mbit/s service, it's not the only Canadian cable operator that's giving wideband a go. Collectively, these efforts should apply some pressure on BCE Inc. (Bell Canada) (NYSE/Toronto: BCE), whose high-end tier -- dubbed "Bell Internet Max 16" -- offers 16 Mbit/s down by 1 Mbit/s up. That's some pricey broadband. It will be interesting to see what their take rate is in this economic environment. I'm not sure where those rates came from. I live in Saskatoon and when I go to Shaw's site (shaw.ca) the Nitro rate is $93 per month.